London, Ontario is home of Western University, one of the best Ontario Colleges, Fanshawe College, and also to the Western Fair. First settled by Europeans around 1826, is now home to 336,500 people and is the seat of Middlesex County. Located half way between Toronto and Detroit, Michigan, London is the largest city in Southwestern Ontario. Located on the banks of the River Thames, like it’s namesake in England, this is a beautiful city with lots of mature trees, earning it the nickname "The Forest City". When you are looking for a family restaurant or somewhere special to dine, check out our London Restaurants section. The University of Western Ontario was founded here in 1878 and now has 29,000 graduate and undergraduate students and 1,164 faculty members. 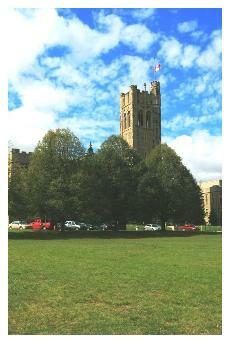 In the Maclean’s magazine rankings of Canadian Universities, UWO has recently placed in the top five. From City Hall you can take the double-decker bus tours which depart daily and take visitors on a drive around this lovely city which has pleasant parks and countless mature trees. Canadian Medical Hall of Fame at 267 Dundas Street, is a fascinating place to visit, as it is the only National Organization dedicated to celebrating the accomplishments of Canada’s Medical heroes. This organization encourages young people to consider and pursue careers in Medicine and the Health Sciences, by supporting educational programs with the hope of encouraging future generations to excellence in the field. Covent Garden Market at 130 King Street, this market originally opened for business in 1845 and today is a wonderful maze of international food vendors, arts & crafts, fresh fruits & vegetables. In winter there is an outdoor skating rink. While you are there you can have your ticket stamped and park free! Forest City Gallery is located at 256 Richmond Street and The Forest City Gallery serves the professional and emerging London art community by providing space for exhibits, concerts, book launches, professional development workshops and its signature Art Talk series. Jet Aircraft Museum located at 2465 Aviation Lane, which is out near the London Airport, and if you are interested in flight and aviation, this museum may be of great interest to you. The Jet Aircraft Museum currently is operating from a hangar located at the London International Airport in London. The Grand Theatre on Richmond Street, has a long and interesting history, you can check out their website for this seasons performances. My family went to see a performance of "My Fair Lady" last winter which was truly amazing - we were riveted for the full two and a half hours of the show. The acting was lovely, the choreography was spectacular and I would recommend their shows to anyone. The Arts Project is a non-profit art gallery, theatre and studio space for artists located at 203 Dundas Street. Their mission is to bring arts and culture to the downtown core of London, by providing the space and the means for artists to do their work and by providing a venue for the public to see their work. Open from noon to 5:00 pm each Tuesday to Saturday, year round. Western Fair this fair has Events & Shows, Horse Racing and Slot machines, but my favourite place is the "Top of the Fair" Restaurant. Check out their site for a full list of this years activities. White Oaks Mall has around 175 stores and services and is a great place to visit if you like shopping. Located on Wellington Road in the south part of the city just north of highway 401. Masonville Place Shopping Mall - located in the north of the city at the corner of Richmond Street and Fanshawe Park Road and this two-level shopping mall has around 160 stores, services and restaurants. Western University, London known locally as "UWO" or "Western" this is considered one of the top five Universities in Canada, so we are fortunate to have this great school here in Southern Ontario. The Regional Museum the Regional Art Museum is at421 Ridout St North, and Eldon House is at 481 Ridout St North. An "Aladdin's Cave" of both Canadian and International Art. Fanshawe Park and Pioneer Village this lovely Conservation Area in the north east corner of London, is well worth a visit. Adults and children alike will enjoy the Pioneer Village, which is staffed by volunteers in Period Costume who guide visitors around this re-creation of a 19th century Ontario village. There is a beautiful lake, camping, and hiking and walking trails for visitors to enjoy. Victoria Park located downtown - I added this one because it is one of my personal favourites - you could take some peanuts and feed the tame squirrels. If you are in London in winter, there is ice skating in Victoria Park which is decorated and illuminated for the Christmas season. Places to go if you have children with you! I will be adding to this list as I discover more places that I think kids will enjoy. Regional Children’s Museum located at 21 Wharncliffe Rd South, is a wonderful place to take children of all ages. Many years ago we took my father there with my children, and I’m not sure who enjoyed it the most! Storybook Gardens a wonderland for children - animals and adventures for children of all ages. The Museum of Ontario Archaeology (Formerly Museum of Indian Archeology) is just off Wonderland Road, at 1600 Attawandaron Road. My daughter's Home-school group went here for a "dig" last year and it was amazing. 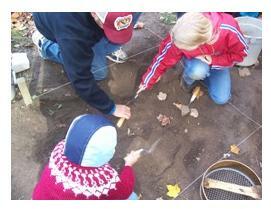 They found buried artifacts and learned a lot about the culture and life of Canada's Native People of this area. Here is a picture of a Native dwelling at the Museum. This is a great place for a School Field Trip, or for parents and Grandparents to take children during the Summer holidays. Here is our daughter and her friends excavating an artifact at the "dig". The Museum of Ontario Archeology even has a Summer Day Camp, check out their site (above) for more information on this great summer activity for children, where they have fun, and also learn about Canada's First Nations People. Adventures on Wonderland this is one of our favourite places on a rainy afternoon. There are activities for babies, toddlers and older children and there's a cafe to purchase food while you are there. Lots to keep your little ones busy!